Steyn 1988). Even though environmental engineers have not obtained a confirmed, quantitative knowledge based on fundamental behavioral patterns and kinetics, they have designed activated-sludge systems to achieve the required degree of biological phosphorus removal (Hong 1982; Wentzel et al. 1985; 1988; Hong et al. 1989; Kang et al. 1985; DeFoe et al. 1993). Many full-scale plants, especially in the United States, have been installed in the past ten years. To induce enhanced phosphorous uptake by activated sludge, the system must subject the process biology to a period of anaerobiosis prior to aeration; a prerequisite for EBPR is the proper selection of organisms. Environmental engineers can accomplish anaerobiosis by subjecting the sludge or mixed liquor to anaerobic/aerobic cycling (Davelaar et al. 1978; Nicholls and Osborn 1979; Berber and Winter 1984). Consequently, microorganisms capable of storing phosphorus as polyphosphate in their cell mass proliferate in the system. Figure 7.38.1 shows typical concentration profiles for BOD and phosphorus. The release of orthophosphate mirrors the rapid uptake of organic substrate (BOD) in the anaerobic environment. In the aerobic zone, orthophosphate uptake to very low concentrations and continued removal of BOD occur. Several explanations for these concentration profiles have been offered. Among them, the hypothesis offered by Hong et al. (1982) gives a plausible account of the biological mechanisms. 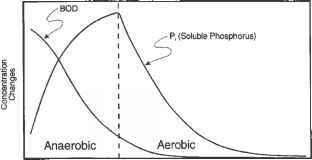 The breakdown of polyphosphate in the anaerobic zone to generate energy for active transport of substrate into the cells of phosphate-accumulating organisms explains the phosphorus and BOD concentration changes in the anaerobic environment. Consequently, this environment serves as a selection zone; phosphate-accumulating bacteria, identified as the genus Acinetobacter, have a competitive advantage and proliferate in the system (Fuchs and Chen 1975; Claete and Steyn 1988). As phosphate-accumulating and other organisms reach the aerobic environment, most readily available BOD is contained inside the high-phosphate bacteria. As the trans ported BOD is oxidized, the resulting energy resynthesizes polyphosphate and forms new cells. The new cells are responsible for net phosphorous removal in the system. The result of the alternating anaerobic/aerobic operation is wastewater with a low-effluent concentration of BOD and soluble phosphorus, and a waste sludge high in bound-polyphosphate content. 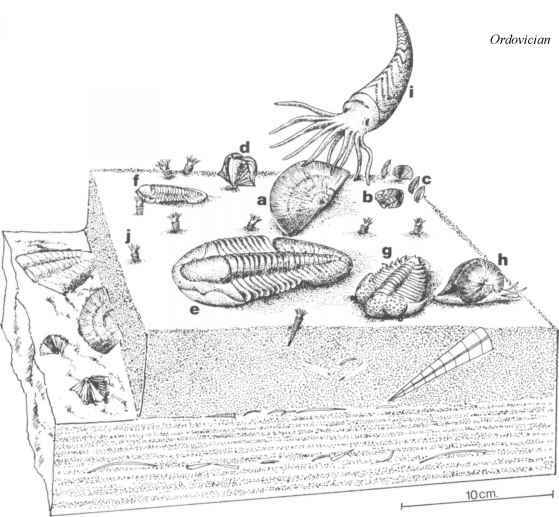 Tracy and Flammino (1987) postulated a more detailed biochemical pathway to further explain the apparent relationship between substrate metabolism and polyphosphate storage. Figure 7.38.2 shows a simplified version of this postulated pathway. The stored organics are reported to be polyhydroxybutyrate (PHB) (Bordacs and Chiesa 1988; Hong et al. 1983). Environmental engineers have conducted microscopic examinations on mixed liquor samples from EBPR and conventional activated-sludge processes (Hong et al. 1982). They treated the samples with Neisser stain, which detects polyphosphate-containing volutin granules. 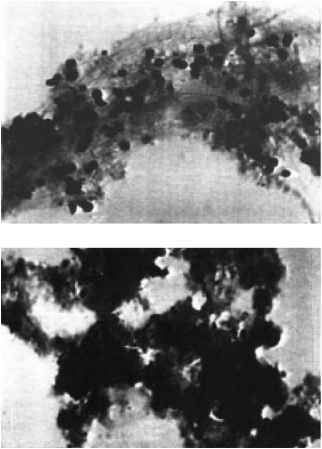 Figure 7.38.3 shows photomicrographs of the stained samples (U.S. EPA 1987). With the Neisser treatment, darkly stained matter indicates the presence of polyphosphate. As the figure shows, the mixed liquor sample from the EBPR process contains a denser volume of stored polyphosphate. The rate and extent of phosphate removal is related to the type and quantity of soluble substrate in the influent wastewater. Studies show that low-molecular-weight fatty acids (VFAs), such as acetate, are the preferred carbon source (Wentzel et al. 1985; 1988). Additionally, cationic species such as potassium and magnesium, are required for polyphosphate synthesis (Hong et al. 1983). Typical municipal wastewater contains sufficient soluble substrates and cations for biological phosphorus removal. With given influent wastewater characteristics, an EBPR system designed for a higher F/M ratio generally achieves a higher degree of phosphorus removal. A system operating with a higher F/M ratio produces a larger amount of cell mass (sludge) to incorporate phosphorus. Since sludge production and wasting are responsible for net phosphorus removal, this parameter is key to successful biological phosphorus removal. FIG. 7.38.2 A simplified biological pathway of a nutrient removal process. FIG. 7.38.1 Biological explanation for changes in BOD and phosphorus in an EBPR process. FIG. 7.38.3 Photomicrographs of stained, mixed liquors. top, EBPR sludge showing high concentration of polyphosphate deposits (1000X); below, control sludge showing absence of polyphosphate deposits (1000X). The temperature and pH effects on EBPR processes have seldom been studied. Sell et al. (1981) postulated that the organisms responsible for phosphorus removal are facultative psycrophiles. Laboratory results indicate that phosphorus removal is enhanced as the operating temperature decreases. Like most biological reactions, the organisms in the EBPR process favor a near-neutral pH. The results of an extensive laboratory study showed that the maximum phosphorus uptake rate is obtained in a pH range of 6.8 to 7.4 (Krichten et al. 1985). The rates drop gradually to approximately 70% of the maximum at a pH of 6.0. Below 6.0, the rate drops rapidly, with no removal at a pH of 5.0. However, experience in full-scale operations indicates that the effects of pH on the EBPR are more severe (Hong and Andersen 1993).